Amplio Apartamento Estudio, situado justo encima de Zoni Beach. Un paseo fácil. Este encantador apartamento privado se encuentra en el extremo este de la isla en una calle sin salida en una ubicación extremadamente tranquila. La vista es magnífica y el paseo a la playa de Zoni está a solo 10 minutos. El sonido de las olas es tan relajante y apacible. Se encuentra ubicado en una casa privada y tiene una gran malla de patio, ideal para el almuerzo o la cena. Hay una nueva cubierta con una parrilla de gas. El apartamento está amueblado con una cama king size, sillas cómodas y una pequeña cocina. Por favor, no dude en ponerse en contacto conmigo antes de reservar directamente en el sitio web. This studio has everything you could want: cleanliness, fully stocked kitchen, outdoor gas grill, great patio, surreal view of the ocean, close to the secluded Zoni beach, and kind hosts. Unfortunately, the noseeum and mosquitoes made the stay quite unbearable at times as the window screens are not effective against the tiny nosseum. It's hard to overstate how awful nosseum bites are. Bring lots and lots of deet and spray liberally. Had a lovely stay, despite travel delays. Bonnie was very sweet and helped me find an alternate flight to get us to Culebra when our flight was cancelled. Once there, we enjoyed the room, eating most meals on the screened in porch with view of Zoni Beach and beyond. Enjoy getting away from it all with great beaches all around. My wife and I have been going to Culebra for twenty years as our winter escape or more to the point a mental health vacation. This year was our first stay at the DiSilvo's property and we were not disappointed. We had a wonderful week. The apartment is very comfortable with a decently equipped kitchen; nice bathroom with a shower with a view; the bed was comfortable (firm mattress) and we slept well - an important factor for a vacation. The property has a big yard with a view of the sea and the island Cayo Norte. Their is a screened in porch and a nice patio. We loved to sit outside and watch the sunset slowly fade to dark. It is a great place to star gaze. The 10 minute walk to Zoni is a definite plus. Zoni has always been one of our favorite places on Culebra - it has a wildness to it that appeals to us. Also this part of the island is very peaceful and away from the, thought be small, hustle-bustle of town. This is the only VRBO rental I've stayed in where the pictures truly don't do it justice. The views from the apartment, the deck, and the shower (yes, the shower) are incredible, overlooking the sea, with Cayo Norte in view, you'll see a yacht or two pass between. The house is halfway up a hillside above Zoni Beach, where there's always a pleasant breeze. You've got everything you need if you're a couple or a single traveler - fridge, oven, microwave, coffee maker, private bathroom and shower, king size bed, even beach chairs. You'll want to rent a car or a golf cart so you can get back and forth to town or to any of the other beaches besides Zoni, which is an easy walk. Zoni Beach is secluded, but if you're adventurous, nearby Resaca and Brava beaches, which both require a hike, are even more remote and beautiful. Owners Bonnie and Sam are terrific. They are longtime Culebra residents, and will give you as much guidance as you need, or leave you alone if that's what you prefer. I could have spent a week or more in this apartment, and the price is right - huge bang for your buck. There could not have been a better place for us to celebrate our honeymoon. Bonnie and Sam have made a fabulous getaway and you can see the care they have put into making every visitor as comfortable as possible. The location and view is amazing. We loved being so close to Zoni beach! My husband and I rented a couple paddle boards and snorkels for the week and it was so much fun! We found fabulous snorkeling, right in Zoni, and were also able to paddle to different areas away from everyone. We spent a week at the apartment and still could have gone to many other beaches. The apartment is perfect with a special screened in patio in case you needed a sun escape, but still wanted to feel like you were outdoors. All the screens and open windows were perfect - we didn't miss AC at all, and loved hearing the ocean every night. I would recommend checking the restaurant schedule when you get to the island to plan your meals a little. Some of the places that people recommended were closed the days we tried to go to them, but it was pretty fun and easy to cook in the well stocked kitchen and the deck outside is absolutely fabulous in the evenings. Was a perfect place for a sunset cocktail. It's a pretty quiet little town, but definitely fun to head in and join the boating scene from every one cruising in on their dinghies. I know we'll be back to Culebra and will definitely stay with Bonnie and Sam again! 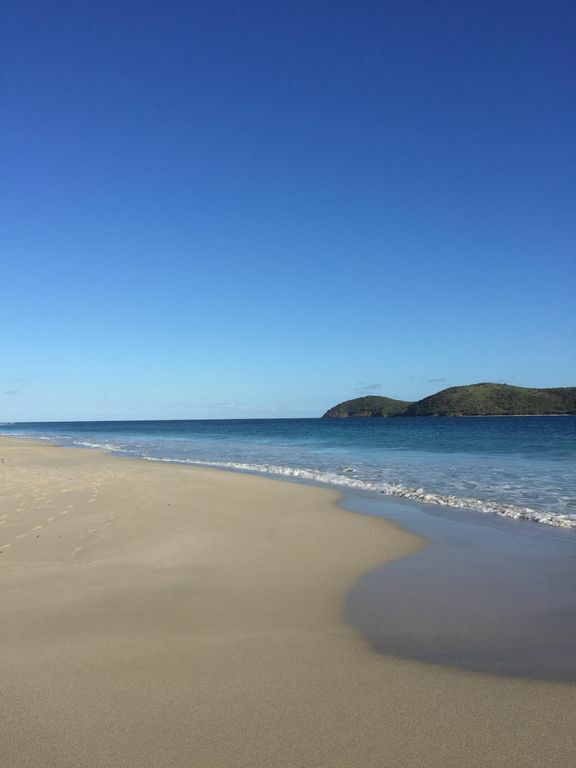 Culebra es una pequeña isla situada entre Puerto Rico y St. Thomas. Es muy poco desarrollado y prístina. Cuenta con varias playas magníficas, todas las cuales son de fácil acceso y son ideales para nadar, snorkel, buceo y pesca. Varios restaurantes ofrecen cenas informales. Es un lugar muy discreto. No cancellation allowed - you may change the dates for another time during the next year but otherwise no cancellation is allowed.